Based in Ghent, Belgium, ROA is renowned for his giant black and white animals. ROA started painting abandoned buildings and warehouses in the isolated industrial areas of his hometown. Since then, his work has been seen in New York, London, Berlin, Warsaw, and Paris. [vimeo]http://vimeo.com/24784781[/vimeo]Based in Ghent, Belgium, ROA is renowned for his giant black and white animals. 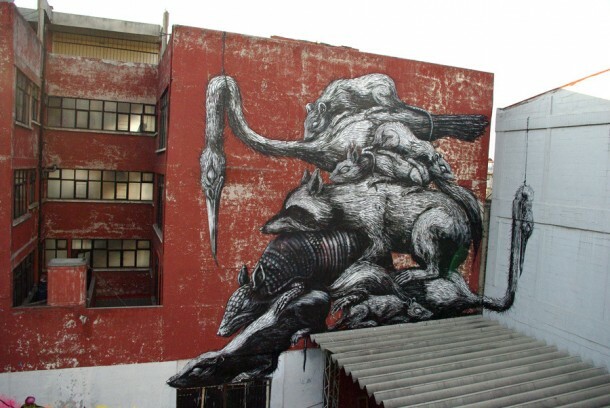 ROA started painting abandoned buildings and warehouses in the isolated industrial areas of his hometown. Since then, his work has been seen in New York, London, Berlin, Warsaw, and Paris. I in addition to my buddies have already been examining the excellent thoughts from the website while suddenly I had a terrible suspicion I had not thanked the site owner for them. The young boys appeared to be certainly glad to study them and now have honestly been having fun with them. Many thanks for actually being very accommodating and also for using these kinds of beneficial ideas millions of individuals are really eager to understand about. Our own honest regret for not expressing appreciation to you earlier.